I found a nice red leaf in the park yesterday. The snow is starting to fall, so I might have trouble finding leaves soon. I should have a few more tries though before they all turn brown. This one stood at an odd angle on the paper, which made the shadow difficult for me. I tried to blot color to darken the shadow, and it really mottled the wash. Next time, I’ll have to stick with a single pass in order to get a clean flat shadow. I tried to demonstrate the angle of the leaf by deepening the values on the left, and leaving the right side lighter. It came close to working, but didn’t really capture the angle that I was after. I might have been more successful if it weren’t for the fact that I sketched it, and painted the shadow last night. Then, while I slept, Sansa (my cat) ate half of the leaf. So, I had to try to remember what it looked like. Next time, I’ll have to try to paint it all in one go. The leaves are really interesting to me, because they change so much while I paint. When I start, they are relatively pliable and have vibrant colors. As I paint, they dry, and curl – changing shape, and texture, and color. 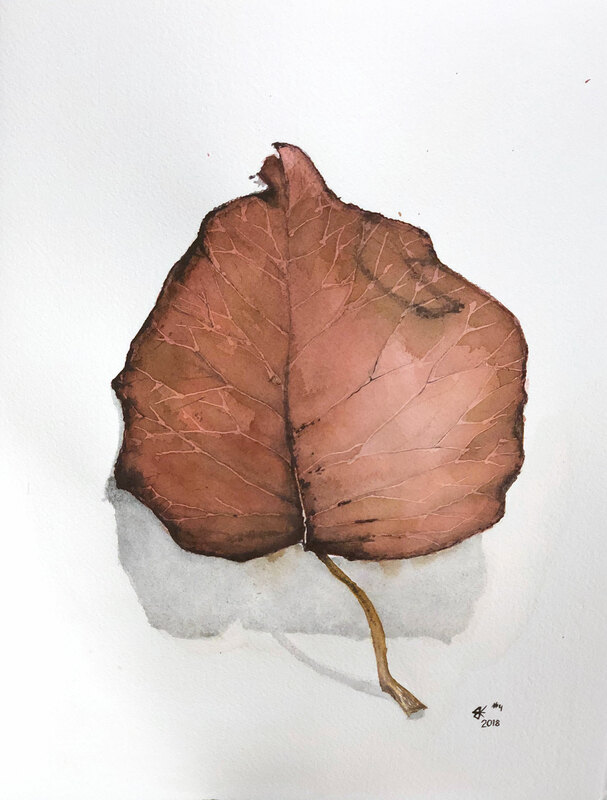 I end up looking at the leaf toward the end of the painting trying to remember what it looked like when I first brought it in. My mom mentioned spraying the leaf to keep it pliable, but I kind of like the fact that I have to paint somewhat from my mind’s eye. I think it’s a good exercise – there is just enough left in the dried leaf to let me map my memory to something. I also really like the fractal pattern in the veins. I don’t think I ever noticed before how the veins seem to grow in the same pattern as the tree. For example, this leaf (what kind of tree is this?) has one vein bisecting the leaf in half. On either side, the veins move out toward the edge, and then about two thirds of the way to the edge, they split in half. Each half goes to the edge, and splits again about two thirds the way there. I start thinking about Zeno of Elea’s paradoxes. The vein can never reach the edge of the leaf because every time it is two-thirds the way there, it forks. This pattern contrasts to the pattern of the Maple leaf, in which seven veins cut the leaf into spears, each spear being two thirds larger than the one before. Each vein then branches in a similar way as it moves to the edge. But while this leaf forks, the veins in a maple leaf continue on after branching, and just grow thinner as they reach the edge. Both trees look very similar. The Maple tree has many branches coming off the main trunk, almost in a star pattern. But this tree (whatever it is) looked like it branched in twine. Also, I just used the word “twine.” And I think I used it correctly.